My name is Marjorie, and I’m the blogger behind Sugar for the Brain! I was pretty excited when Melissa asked me to do this guest post. When she asked me what I would like to do, I told her about the “Birthday Cake” Decorated Cake Roll I made the week before. It was such a huge hit that I really wanted to try other designs! We agreed on a Halloween cake. I just LOVE Halloween. It’s my favorite holiday! 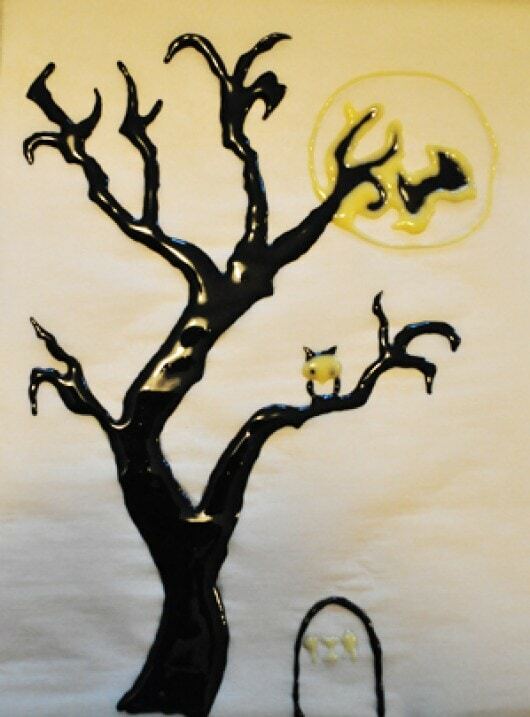 For this cake, I did a Halloween scene. 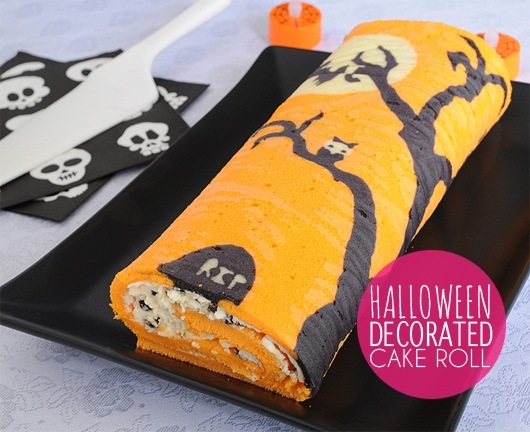 I had so many ideas, so I don’t think it will be the last Halloween cake roll I’m doing this year. Be aware that it is quite time consuming, but you have some free time when you freeze the cake. And, of course, it is so much fun. I’m not even talking about the way you’ll feel when you see it worked! Beat the eggs. Add the sugar while beating. In a little bowl, sift the flour and the baking powder. Reserve. with a spoon. When the batter is homogeneous, add the water. Combine slowly. Reserve about ¼ cup of uncolored cake batter. Then reserve another ½ cup. Add black food coloring. Refrigerate the remaining cake batter while decorating. You can wait before dying the remaining batter just in case you need more. 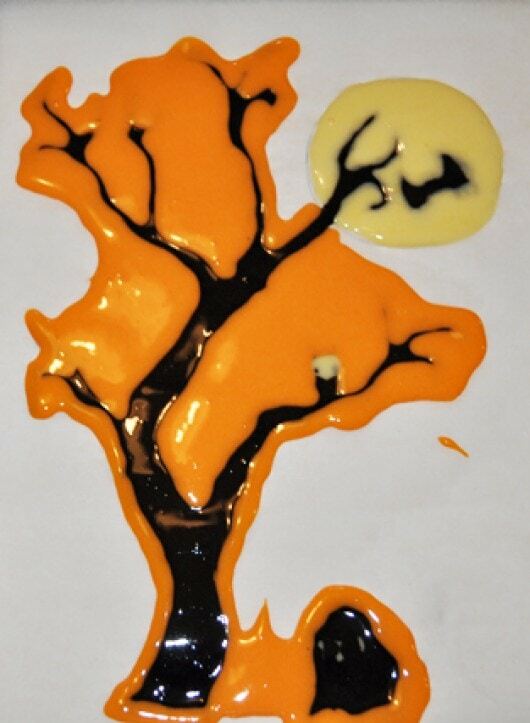 When you’re done decorating, add some orange food coloring. Place the template below on a baking sheet. My template was a bit too large for the cake, so I suggest you make it a little narrower (blue arrows; it was a 8 1/2″ x 11″ sheet). I also suggest that you place it more on the left (black arrow). Place a piece of parchment paper top. 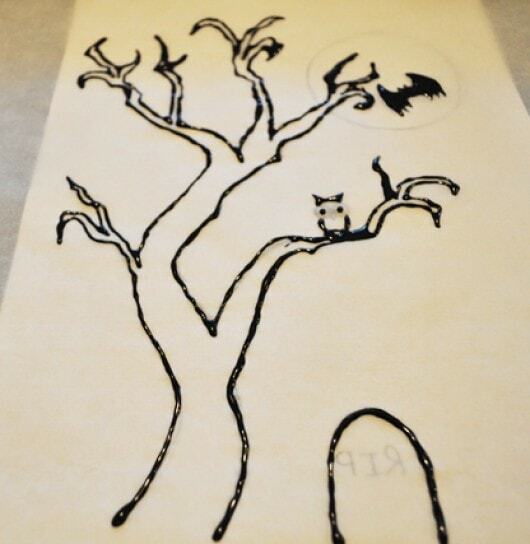 I began by doing the black outlines of the template: tree, bat, grave, and owl’s pupils using a piping bag with a #1 tip. This will help you do the little details. If it’s not enough, use a toothpick to sharpen some details. I did this with the bat. You could also use a Ziploc from which you cut a corner of the size you need. Trace the pattern following the template. Freeze the outline for about 10 minutes (more if needed). 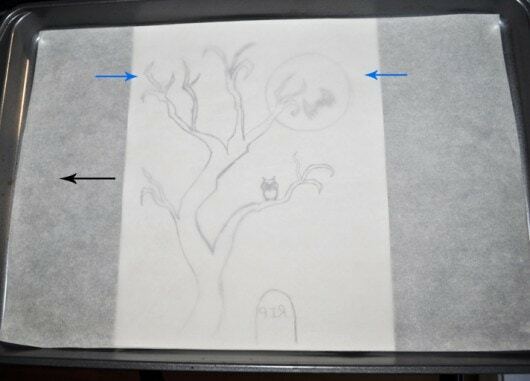 Take the baking sheet out of the freezer then fill the black shapes (except for the grave). Freeze again (freezing prevents the colors from merging. If it’s very hot in your house, be sure to freeze again if necessary). Now you will do the outline with the uncolored batter: owl eyes, RIP inscriptions, and moon. Freeze again. 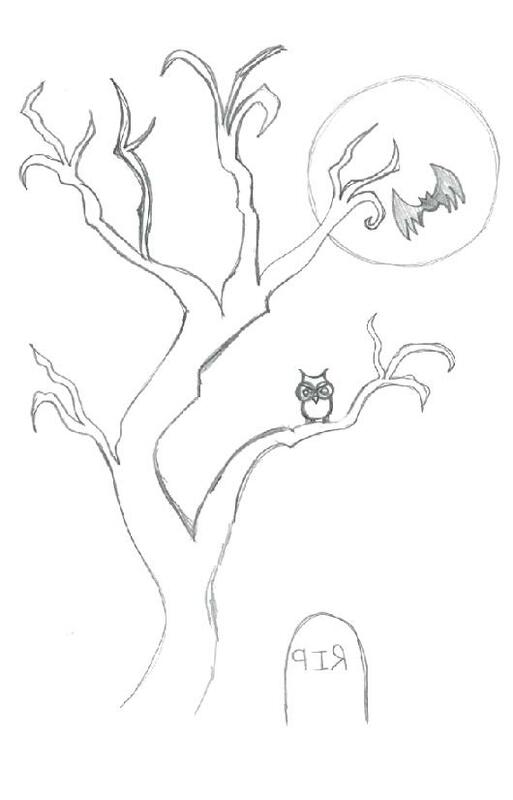 Fill the owl and the grave with black batter and the moon with uncolored batter. Freeze again (we are almost there!). Take the reserved batter — if it’s not orange yet, it’s time to add the food coloring. You will put orange batter all around your shapes. This will prevent the shapes from deforming when you add the remaining batter. Freeze for the last time. When the decoration is set, remove the template from under your parchment paper (so that the parchment paper with your decorations is directly on the baking sheet), and then pour the remaining batter over the baking sheet where there is no batter yet. Spread evenly with a spatula. Bake the cake for about 10 minutes. Don’t over bake because it will be hard to roll and it might crack. Lay parchment paper on your counter (or a clean kitchen towel). As soon as your cake is out of the oven take the cake out of the pan, turn it over on the other piece of parchment paper on your counter, and remove the parchment paper it was baked in. Turn the cake again so that the decorations are facing the counter. Roll the cake in the parchment paper and let cool (you should roll it beginning on the side away from the decorations). When the cake is completely cool, unroll, then spread with the filling. Roll again and you’re done! Enjoy! Our Pleasure girly! You’re a sugar genius! just wondering if you could add a flavoring ( such as vanilla) to the cake batter roll recipe? also what should you look for so far as consistency of the batter ? thanks. This is incredible! I’ve never seen anything like it. Totally rad! This is so freaking cool! I had no idea you could make a design in a cake like this. Love love love it!! That is an amazing cake roll! BRAVO! Hi i’d like to know if the batter has to be poured on the sheet where theres no batter yet but after all the batter will cover the whole pattern right? so cute – I’ve seen several versions of a decorated cake roll but this one is so cute and detailed! The cake batter was SO runny it was dripping out of my piping bag. Was it supposed to be like that or did I mess up somewhere or is it supposed to be like that? Made it very hard to get my lines straight. Yikes! I have never personally made it but I have a friend who did and it was a success. to all your posts! Keep upp the excellent work! I also experienced a runny batter. I added a bit more flour to the black batter and it turned out a good consistency for piping. I left the runny batter the way it was so it was easy to spread all throughout pan. Overall, this was a good recipe to use for detailed deco rolls. Thanks! 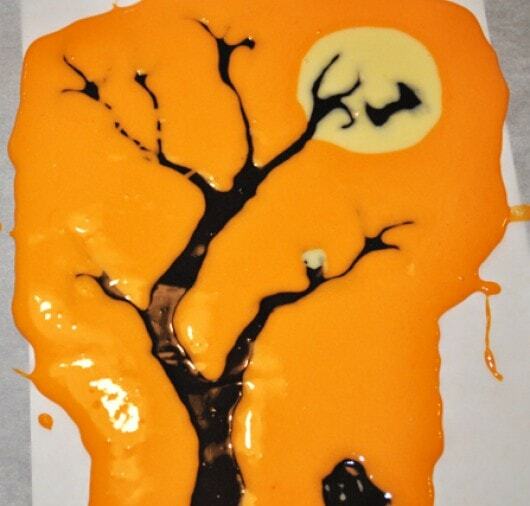 Pingback: Halloween : les scary recettes qui font Boo !